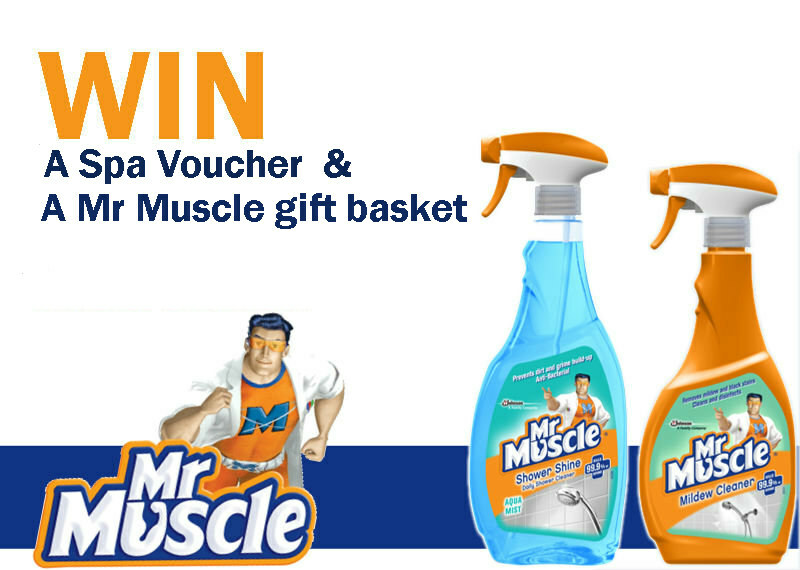 Stand a chance to win a Mr Muscle gift basket and spa voucher! 2.1. Entries for the Competition will open at 17h00 on Friday, 9 December 2016 and will close at 23h59 on Sunday, 11 December 2016 (Competition Period). 6.1. The Winner will receive a Camelot Spa Voucher (Spa Voucher) to the approximate value of R 3 360.00 (three thousand three hundred and sixty rand) and a Mr. Muscle Gift Basket, which includes Mr. Muscle cleaning products to the approximate value of R 250.00 (two hundred and fifty rand) (collectively Prize). 6.2.6. Light Spa Lunch Thalgo Amenity Pack. 6.3. The Spa Voucher can be redeemed at any participating Camelot Spa in the Republic of South Africa and shall be subject to the standard terms and conditions for such vouchers. 6.4. The Prize excludes all items not mentioned in clause 6.1 and 6.2. For the avoidance of any doubt, the Prize excludes any travel costs and/or arrangements to attend a Camelot Spa to redeem the Prize. 6.5. We will contact the Winner per telephone to obtain address details and to make arrangements for delivery of the Prize. The Spa Voucher may be delivered per email within 5 (five) days from confirmation of the Winner and the Gift Basket will be delivered to the Winner per courier, or as otherwise discussed, within 30 (thirty) days from the confirmation of the Winner. 6.6. The Prize must be redeemed by 23 December 2016, failing which the Prize may be forfeited at our sole discretion. 6.7. The Prize, or any part thereof, may not be exchanged for cash any other item. Prizes are not transferable. We reserve the right to substitute the Prize, or part thereof, with any other prize of a similar commercial value.